A beautiful object which happens to be a very efficient kettle. 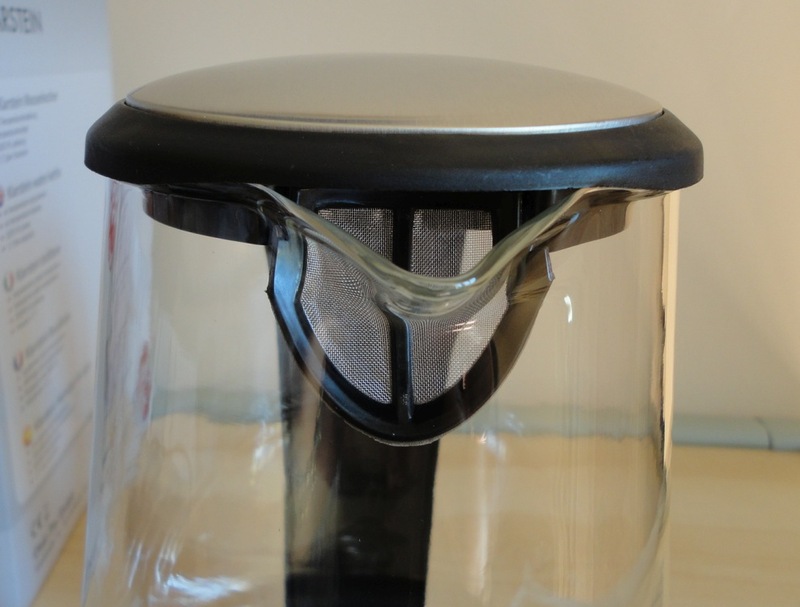 This glass kettle sits on an electrified base, where it is free to rotate 360 degrees. The handle is a lovely, thick, rounded shape that feels secure in the hand. 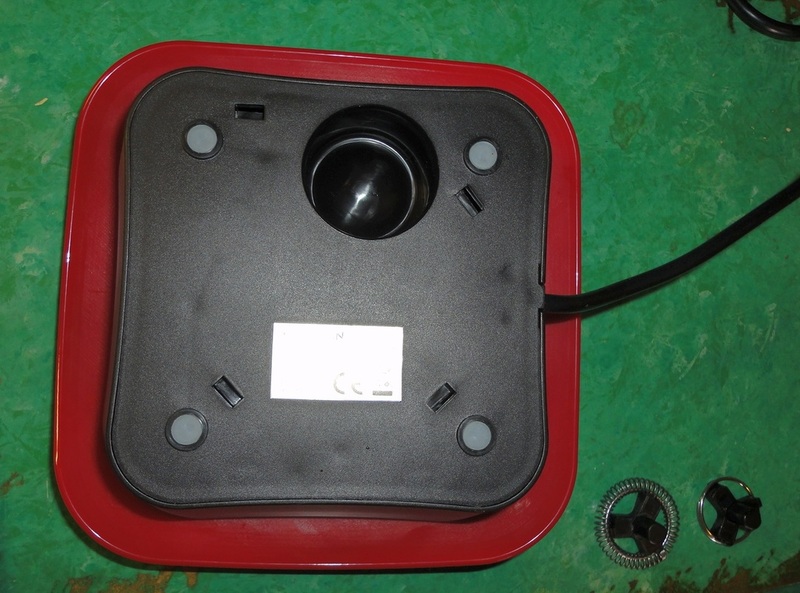 On the inside is an approximate quantity indicator, with three notches for minimum water level (0.6 l), 1.2 l and maximum (1.7 l or 3 pints). The minimum quantity is just right for two cups. 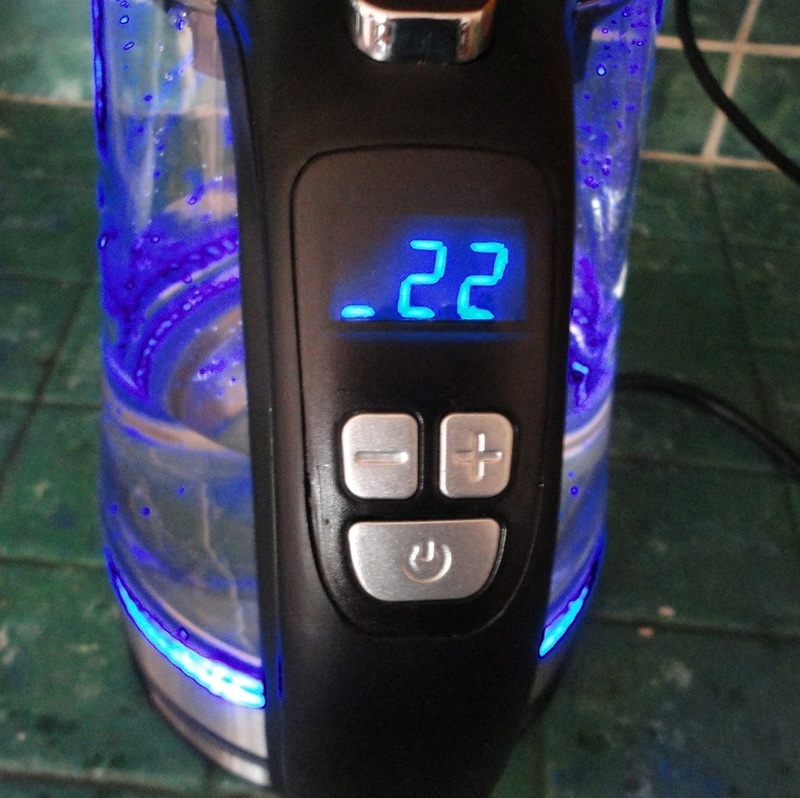 Once plugged in, the kettle beeps to indicate different conditions. One beep for power on. Another beep when the required temperature is achieved and boiling stops automatically. Another beep when you replace the kettle on its base. This kettle has some sophisticated features. On the handle there is a LED display showing the water temperature, both programmed and actual. The default boiling temperature is 100 degrees C, but this can be changed by using the + and – buttons. The ON button starts the boiling process. Once deployed, the kettle lights up blue and the dance of the water bubbles is really a pretty sight, certainly a conversation piece. So, yes, it's only a kettle, but it's also a gorgeous object. A perfect alternative to my trusty manual milk frother. This electric appliance offers two alternatives by means of two magnetic, removable whips: milk frothing and simple milk heating. 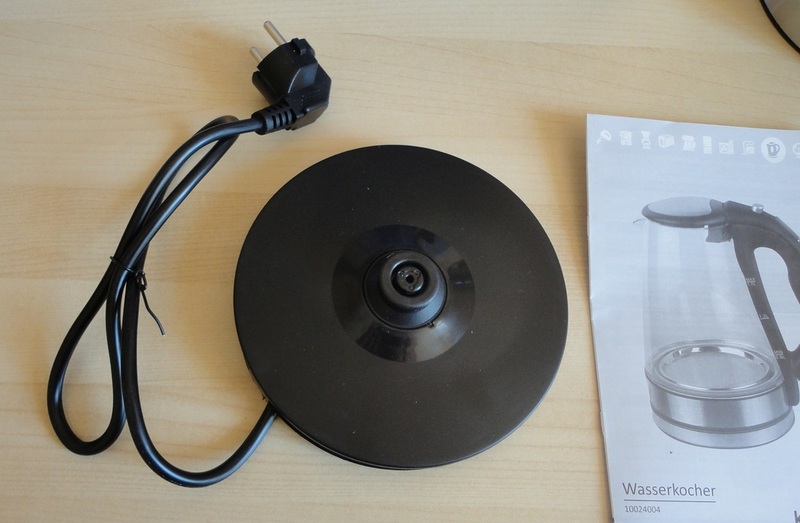 The metal jug sits on top of a heating plate and has a see-through plastic lid with a silicone seal. You pour the milk into the jug, up to one of three levels indicated by notches inside the jug. The bottom one is for minimum quantity; the middle one is the top level for frothing; and the highest notch indicates the maximum quantity for simple milk heating (without making foam). Although the middle level appears amazingly low, you can trust it to be accurate. I have, by mistake, put too much milk and caused the froth to spill over! Once the milk is in, operation is by simply pressing the ON button. The chosen whip whirs into action and the milk is heated to the optimum temperature, safely below boiling. Once this temperature is reached, the Soprano turns itself off. I have timed it at around 4 minutes. There is a two-minute timed safety feature. If you try to turn it on again before this interval, the Soprano whizzes briefly and stops. 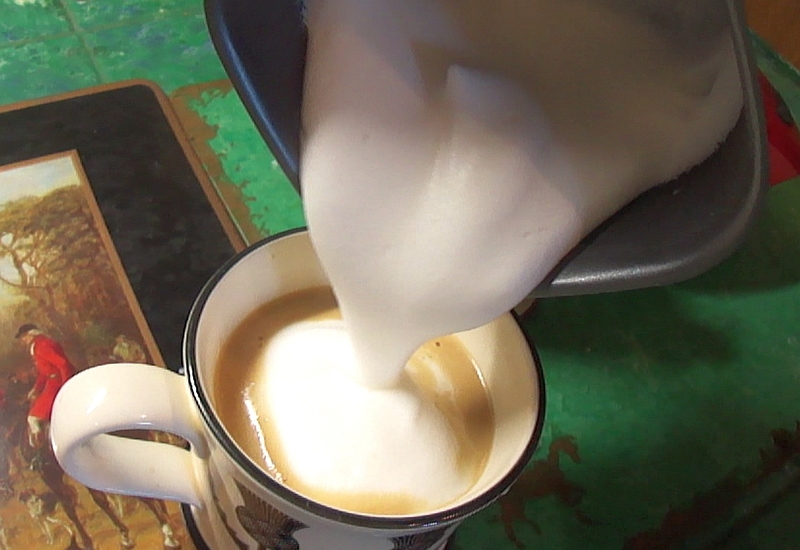 If you need to make more frothed milk in a hurry, you can simply wash and dry the jug and start again. I can't praise this appliance too highly. It is a joy to use, so easy and reliable. 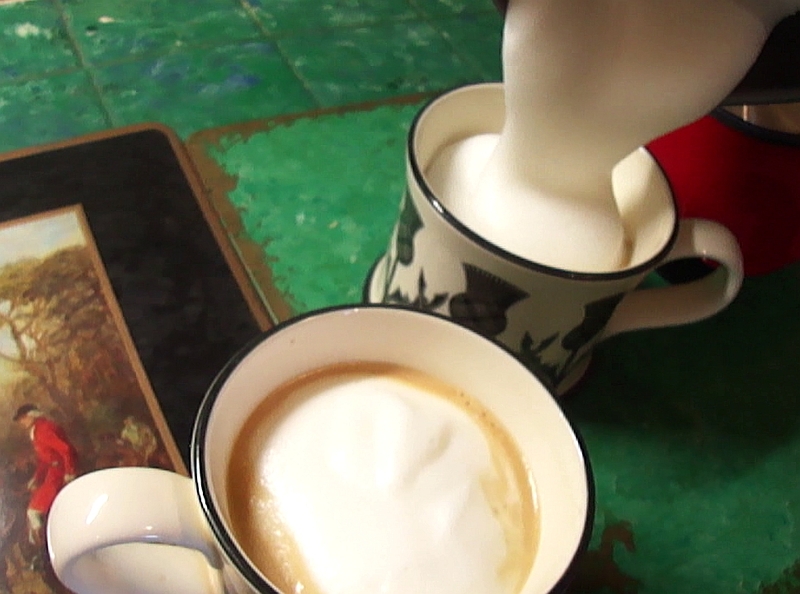 I use UHT milk, cold from the fridge, and the frothed milk is absolutely perfect for a cappuccino. Just be gentle with the non-stick coating because it can scratch. I use a rubber spatula to get the last of the foam. Washing and maintenance are a breeze. Just swish some soapy water inside, rinse and leave it to dry in the air. No dishwasher, please! A beautiful multi-tasking kitchen robot that has made me want to bake again. Bread-making, in particular, becomes enjoyable when you have a capable, sturdy mixer to do all the hard work and anything requiring whipped eggs or a smooth, lower-calorie mayonnaise takes just seconds to accomplish. With three accessories, all mixing, whipping, fluffing tasks are covered. There is a bread hook, a stirring blade for cakes and a whisk for volumising eggs and cream. 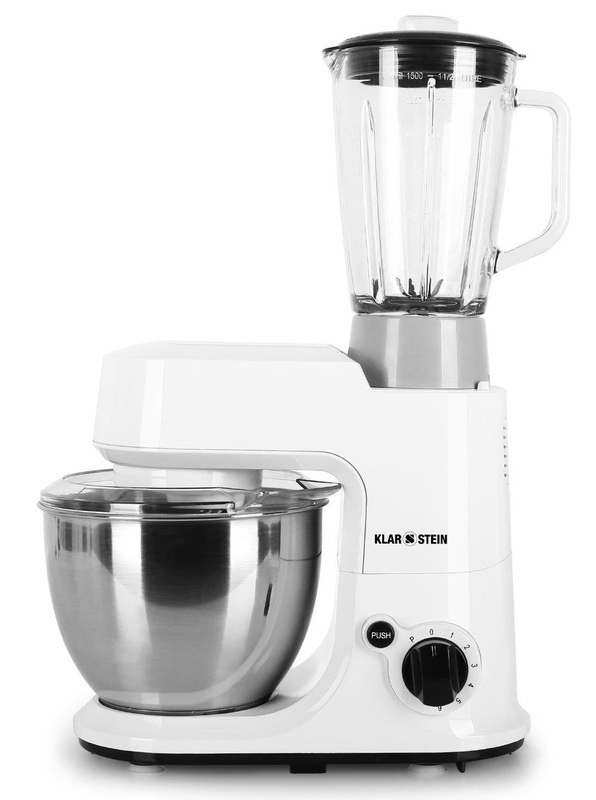 Adding even more versatility, you can tap into the motor's power (800 W) by removing a section of the top and mounting a sturdy glass blender attachment. Operation is via a rotating knob with a choice of six speeds and a pulse function. Four suction cups anchor the whole thing securely to your work surface. The instructions (in English and German) are clear and comprehensive, although I think there is a small error with regard to how to release the top. I tested this robot with several of my usual recipes which I was making by hand, lately, as my previous mixer had stopped working. What a time-saver! I was impressed by the ease with which the blending was accomplished. As it spins, the hook rotates in a small circle inside the generously large (4 litre) bowl, mixing efficiently and neatly (there is also a removable lip to keep the mixture from spilling over. The other thing I love is how easy it is to clean. If you have limited counter-top space, you will appreciate the small footprint. At first glance, the die-cast hooks seemed a bit light and flimsy, but they work perfectly and are easy to mount and remove for washing. 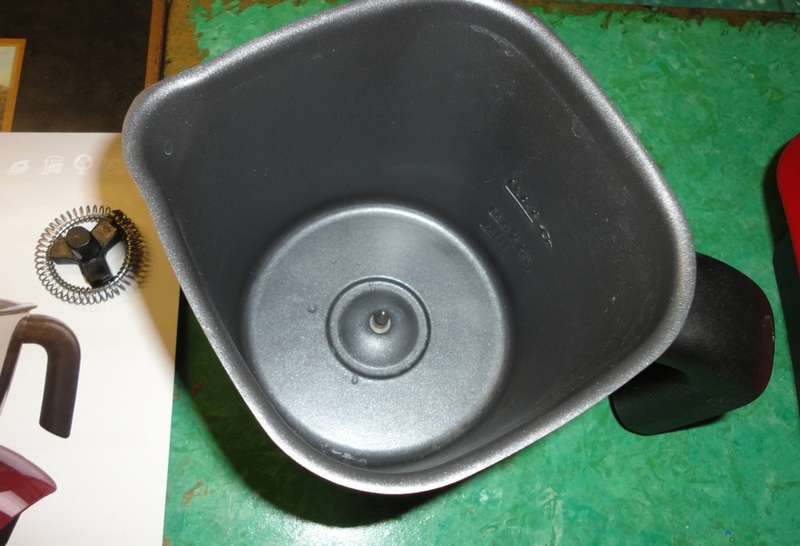 To access the hook, or to remove the mixing bowl, the top of the machine lifts and tilts backwards. Small fingers could get in the way when the top is snapped back into place, so a little supervision would be advisable when children are around. The design is by no means dangerous but it is a moving part and intended to close firmly. I have the white model (Carina Bianca), but there is also a bright turquoise-blue, a beautiful cream shade and an edgy silver. The blender attachment is made of heavy glass, giving a very secure feel. The plastic top simply pushes into the glass rim, which is a refreshing change from my other blender where the top needs to be aligned precisely with notches to be properly sealed. It can get fussy. The Carina blender is very capable of handling fairly heavy mixtures and makes a good job of blending more liquid ones without too much splashing around. For my needs, the Carina kitchen robot is an ideal combination of power, efficiency, ease of use and versatility. It does everything I want it to without complaining and is beautiful just sitting there. 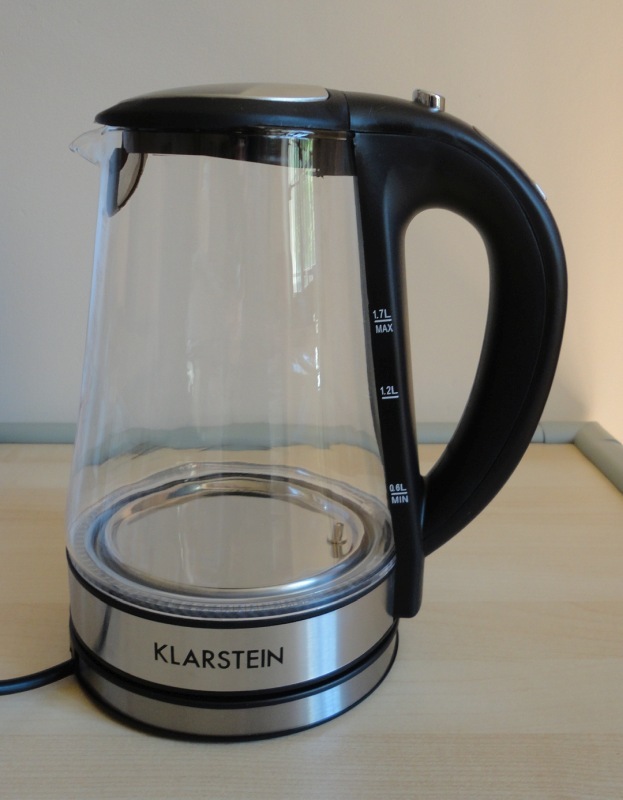 As with other Klarstein products, the price is very attractive and represents great value for money. Please note: a sample unit was kindly provided free of charge for testing and evaluation purposes; I am writing this review with no obligation to do so. 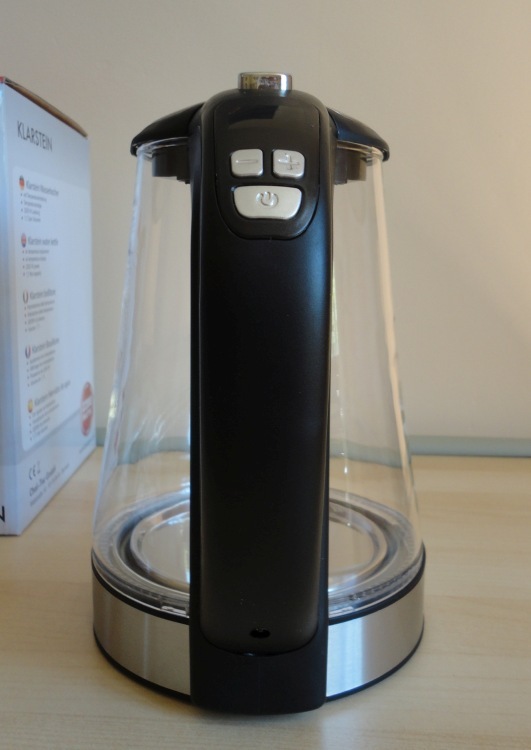 This sleek and elegant coffee grinder is remarkable for being much quieter than my previous one (Braun), and for the speed and efficiency with which it makes a fine powder of coffee beans, nuts and seeds. As I drink Italian-style espresso, it is really important for me to have the coffee beans ground to a very fine and even consistency, and this grinder does that easily. I have tested it with different types of coffee beans, walnuts, Brazil nuts, hazelnuts and a seed mix containing sunflower, pumpkin, and linseeds. 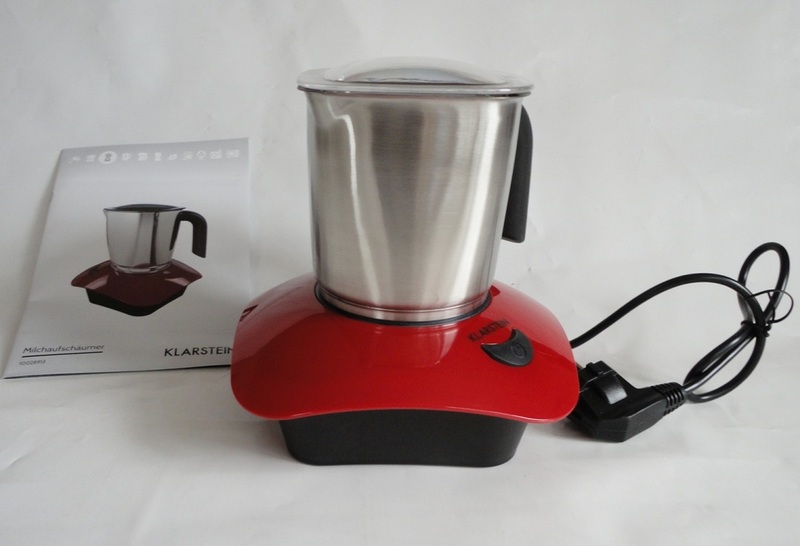 The grinder works quickly and there is an efficient rotating action that ensures that the mixture is evenly ground. All it takes is a few shakes to help the process along. The design is clean and effective. 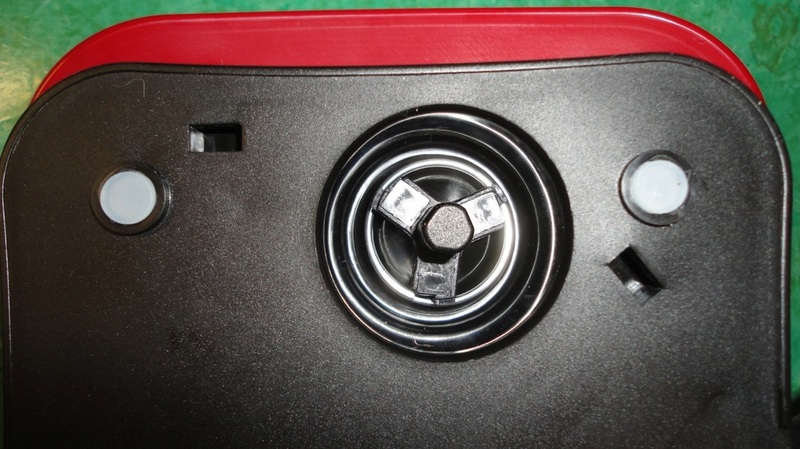 The see-through lid slides down into place and a simple downward push on the central button starts the motor. The rubbery feet keep the appliance perfectly stable. The power cord is a good length (26 inches), has a substantial, quality feel and ends in a solid-looking plug. I was surprised at the capacity of the bowl, it holds much more than I expected. The grinder is easy to clean, and the shiny black finish looks stylish on a countertop. The instructions (in English) are clear and mostly state the customary safety precautions. The only consideration is to run the grinder in 30-second bursts, to avoid cooking the motor. 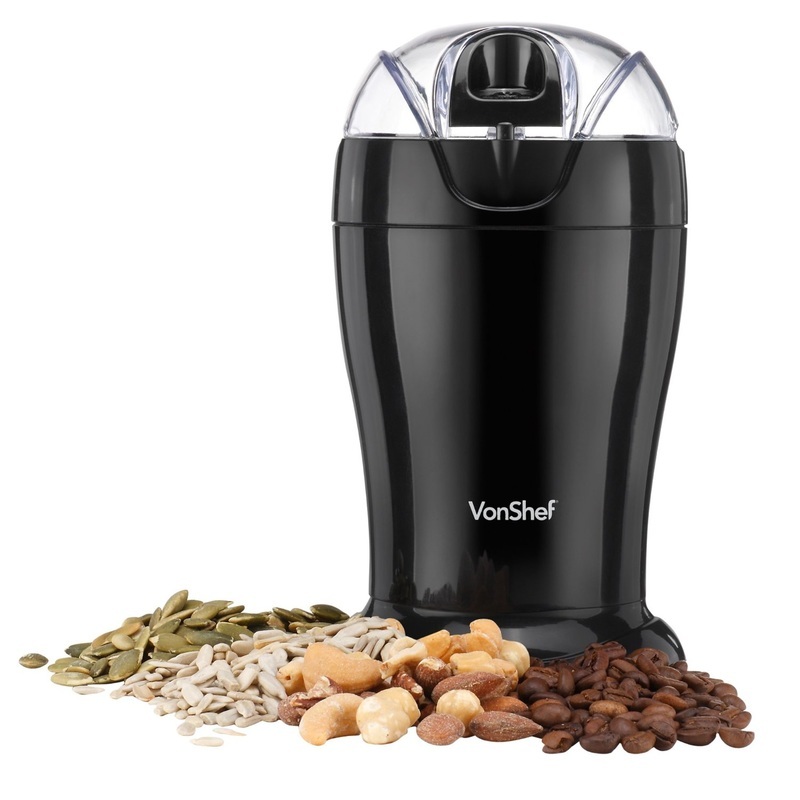 When I was invited to try out this beautiful coffee grinder, I had not heard of VonShef, but having tested one of their products, I am really impressed. Their appliances have the look and feel of some of the top brands, but at a much lower price. A beautiful, superbly-designed, lightweight kettle. I love the way it looks and I enjoy using it. 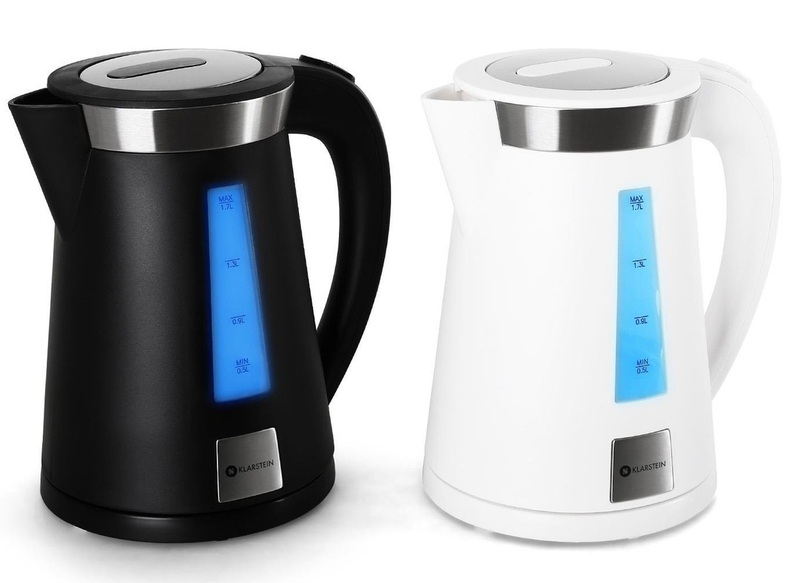 Part of a matched set of three stylish kitchen appliances which have made my morning breakfast ritual a lot more fun, this lightweight kettle lifts clear of its electrified base, allowing me to pour still-boiling water into my teapot or mug. No more fighting to extract the plug and getting scalded in the process. The handle is a lovely, thick, rounded shape that feels secure in the hand. The matt black finish is bisected by two see-through vertical strips, back and front, showing the water level in four increments. If your décor precludes black, there is a pristine white version also available. The maximum capacity is 1.7 litres (3 pints) but I seldom need more than the minimum ½ litre (a bit over a pint). 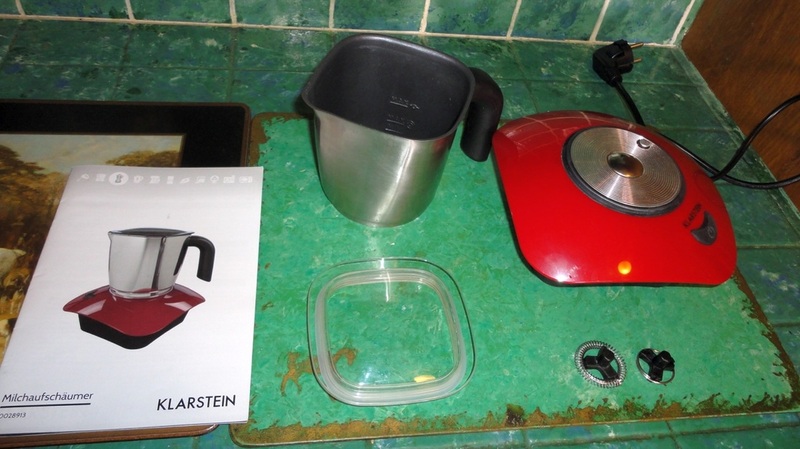 There are two buttons at the top of the handle: one to flip the lid open, and the other of the rocker type, to turn on the kettle and to manually switch off. Since the kettle has a safety cut-out to prevent overheating, the off switch is just an added convenience. The pouring spout is protected by a removable plastic mesh strainer to keep the liquid clear of floating debris. The top opening is a bit narrow, so a long-handled (soft!) 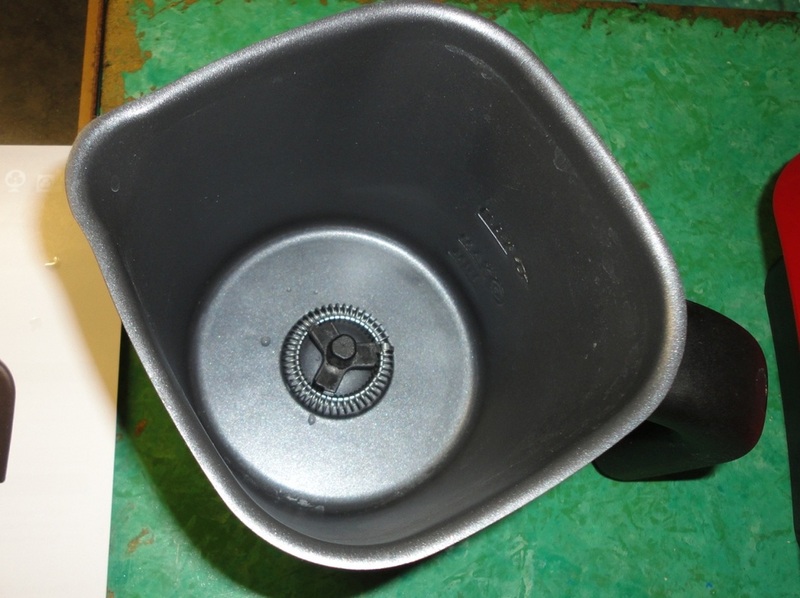 washing brush is needed to reach the bottom plate for manual cleaning purposes, although the usual chemical descaling will be needed from time to time. The instructions (in English and German) are clear and comprehensive. If you are tempted to skip reading the manual (it's a kettle after all), you would miss the advice to run several cleaning cycles before the first use. The best bit I have saved for last: when turned on, a beautiful blue light illuminates the water. I don't know why, but I love it! And it's lightening fast, so no more hanging about waiting for the kettle to boil. So, yes, it's only a kettle, but it's really an excellent one. This two-slice toaster looks very smart with its sleek matt black finish and brushed metal accents. It's very lightweight but sits squarely on small, rubbery feet. The slots are 1 ½ inches wide (4 cm) so fairly thick slices can be toasted without jamming. Operation is the usual manual push-down motion, with spring-loaded ejection when the slices have reached the required toasting. A sliding tray allows easy disposal of loose crumbs. This is a very powerful toaster. With a range of 1 to 7, I normally set it for 3, or 4 at the most, if I want really brown edges. Of course, it depends on how dry the bread is and how thick the slice. Just above the heat dial, there are three buttons: Reheat (if your toast has gone cold); Defrost (for waffles or frozen muffins); and Cancel (to stop the toasting immediately if you see smoke rising, or for whatever reason). The Defrost cycle is longer than normal because it first defrosts, then toasts, all in one step. A removable little rack can be positioned above the slots to gently heat a pastry or anything else that would melt inside the toaster. A couple of minutes is all it takes, then hit Cancel, turn the pastry and repeat for the other side. The instructions (in English and German) are clear and easy to understand. If you decide to skip reading the manual (how complicated can a toaster be? ), remember to run it empty for a few minutes, when new, to let any manufacturing dust burn off. 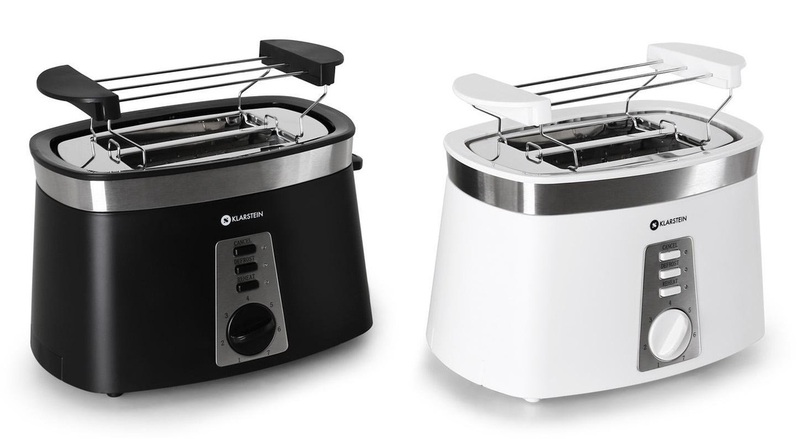 For my evaluation and review, I chose the black model, but it's available in white as well, also matching the other appliances in the set. So, if you are in the market for a fast, reliable and beautiful two-slice toaster, this might be a very good choice. Lastly, the coffee maker is an imposing appliance, working on the drip system and featuring a separate water reservoir with a see-through window showing the water level. I received the sleek, black one, but there is also an immaculate white version. I love the big, rounded handle on the coffee bowl, so easy to hold for pouring. This machine holds 1.5 litres of water, which makes 12 cups of very hot coffee. There is a plastic permanent filter, which is extremely convenient as there are so many sizes of paper filters and it seems one is always out of them, when they are needed. The measuring scoop is a nice extra. 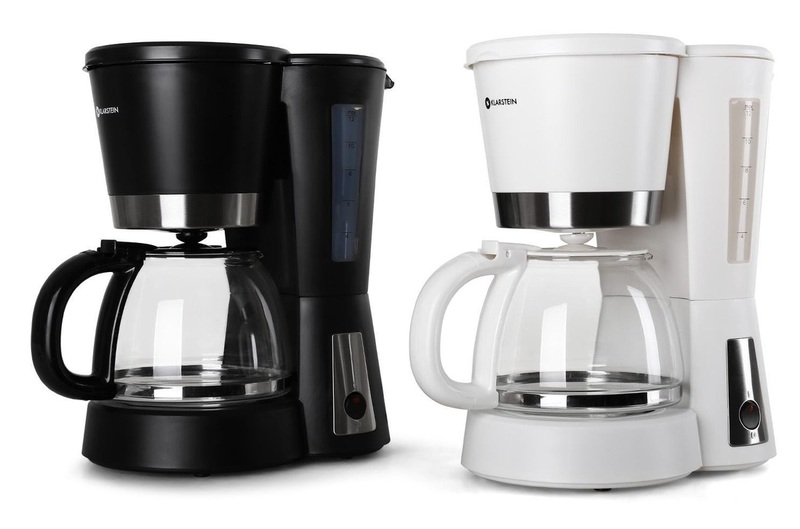 This is a very fast coffee maker, and the warming plate keeps the coffee at just the right temperature without ruining the flavour, although (as we all know) the best coffee is less than twenty minutes old. The instructions (in English and German) are clear and comprehensive. If you are tempted to skip reading the manual (it's only a kettle after all), you would miss the advice to run several cleaning cycles before the first use.